Bong Hee found Hae Joo and her family under the bridge and offered to help them. They pushed the cart to President Jung house and saw Butler Park who was shocked to see them. Bong Hee stopped the cart and went in to look for her sister Guem Hee. In Hwa was glad to see her friend Hae Joo and even asked her mum to help them but Guem Hee disapproved. Chang Hee offered his house to act as a temporary shelter for them instead. On the other hand President Kang was wrongly arrested by the authorities. Kang San watches helplessly as his grandfather was led away by the officers. Guem Hee demanded President Jang to release Jeong Woo and he agreed to help. Hae Joo was drying the clothes and bedsheet and Chang Hee gave him a hand. While flipping the laundry together, Hae Joo accidentally fell on Chang Hee and they hugged each other. At this time, ll Moon interupted their moment. He spilled insults on the both of them, to the point when Hae Joo could not take it anymore and used a broom and hit ll Moon. Guem Hee witnessed this and was displeased with Hae Joo. At night, Hae Joo comforted her mother and assured her that everything will be fine. Bong Hee waited for Jeong Woo outside the police station and when she saw him, she gave him a big hug. President Kang was released from the police station and he instructed Kang San to study at the states. His shipbuilding plant company was force to give up and he wanted Kang San to attained it back when he grows up. Kang San went to look for Hae Joo and he met ll Moon who gloated at his misfortune. In a moment of anger, Kang San punched ll Moon on the face. Hae Joo met Kang San and the latter gave her a ship model in exchange of Hae Joo Hairband. He gave Hae Joo a hug after he revealed that he will be studying at the United State. Chang Hee witness the scene and Hae Joo hurriedly pushes Kang San away. Kang San told Chang Hee that he will be leaving to the states and urged Chang Hee to leave the house when he grows up. President Kang was devastated with the loss of the shipping company to President Jang. On the other hand Kang San get ready to board the plane and In Hwa came to see him off. Hae Joo and In Hwa were trying on new dress and In Hwa suggested to Hae Joo to bun up her hair. President Jang saw the scarred mark at the back of Hae Joo neck and felt uneasy. He asked Hae Joo stepmother whether Hae Joo is her biological daughter to the surprise of Bulter Park. She replied that Hae Joo is indeed her daughter and on the other hand she wonders how President Jang know about Hae Joo parentage. President Jang ordered Bulter Park to relocate Hae Joo and her family. In a bid to chase Hae Joo and family out of the house, he volunteered to pay the debts on behalf of the family. In Hwa was sad to see Hae Joo move to another hometown and insisted that they keep in contact. Hae Joo read the note which Chang Hee passed to her and was deeply moved. Just at this moment, she asked the driver to stop the lorry and headed to the cliff. She promised to her father that she return to Ulsan again. The housekeeper intended to throw the garbage away when Guem Hee saw the yellow sweater and she was reminded of Yoo Jin. Guem Hee demanded to find out the truth and Butler Park called the debt collectors to change the plan. Geum Hee went to the house and was surprised that it was abandoned. Hae Joo and her family was locked up in a place. They tried to dig the ground and remove the stones underneath the door. 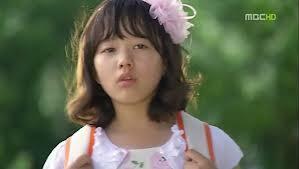 Hae Joo had an idea, she asked Young Joo to crawl under the door and open the door from the outside. Hae Joo and family was rescued but they met the debt collectors on the way and had to hide themslves. Hae Joo used herself as the bait to distract the debt collectors while her family run away. Guem Hee was looking for Hae Joo frantically while Hae Joo family waited at the bus terminal for her. The debt collector caught Hae Joo and pushed her to the boat but she fought back and ran away from them. She came to a dead end at the cliff and she jumped into the water. In Hwa is pretty cute although she is a pampered princess. I am glad that she is nice to Kang San and Hae Joo. It is kind of sad that Kang San had to go through so much at such a young age. He had the burden of getting back all that his grandfather lost from President Jang. Guem Hee finally knows that her daughter Yoo Jin could be still alive and suspected to be Hae Joo. This is the beginning of finding her daughter again after going on a merry-go-round. I am glad that Hae Joo mother actually wanted to show affection to her but find it difficult to do so. This shows that her mother is not that wicked or bad as what i thought initially. She does appreciate Hae Joo and treated her like her own daughter afterall. I like the heart bumping moment between Chang Hee and Hae Joo, whereas Kang San will be the third party. It is the kind of crush that teenagers experience and it is usually most memorable. The next episode is the adult cast. Looking forward to how the story goes from here.